The first step to troubleshoot GE refrigerator defrost problem is knowing the components of the defrost system and their location. The defrost system is made up of several components that work together in order to melt the ice of the evaporator coil in the freezer. Below is a list of those components. 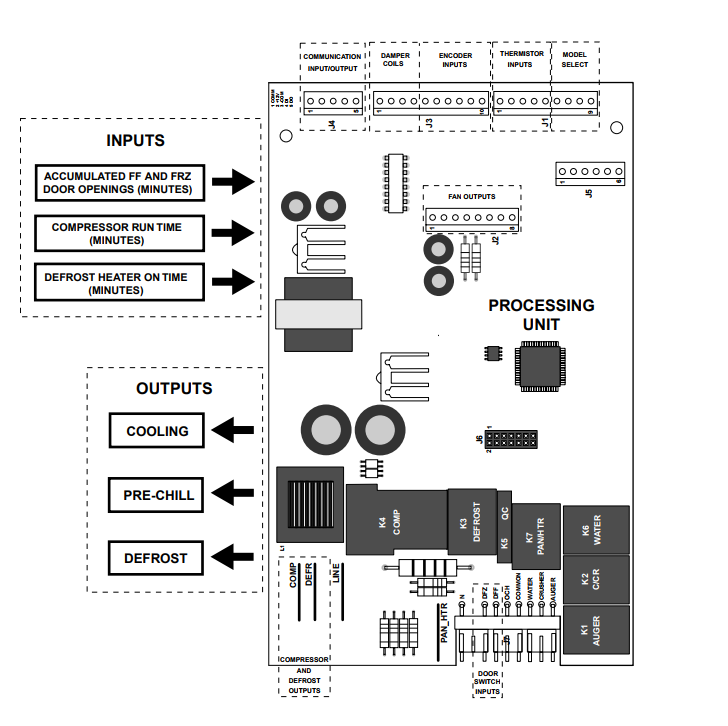 The main control Board : The main electronic control board monitors the temperatures of the evaporator area and determines when to start the defrost cycle. The main control board is located on the back of the refrigerator behind the cover panel. On some models the board will be mounted horizontally instead of vertically, but that does not matter they are all the same board. 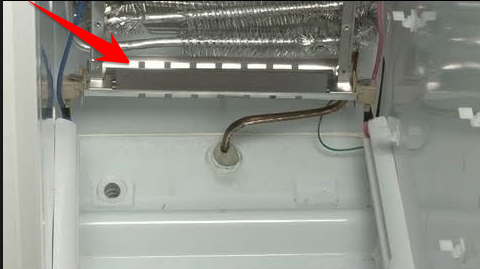 Now that you know the location of the board you will also need to know the GE refrigerator main board pin layout. The pin layout is shown in the image below, make note of the location of the J1 pins. 2. Evaporator Thermistor : The evaporator thermistor is clipped to the top of the evaporator and the main control board monitors the resistances that are sent from the thermistor to determine the temperature of the evaporator. 3. Defrost Bi-Metal Thermostat : The defrost bi-metal thermostat also clips to the top of the evaporator and is a safety feature so that the defrost heater can not come on if the temperature is not cold enough in the freezer. It will only make a closed circuit and allow voltage to the defrost heater if the temperature in the freezer is low enough. 4. Defrost Heater : The defrost heater is mounted at the bottom of the evaporator. When the control board determines its time to defrost the evaporator it will send voltage to the defrost heater which heats up to melt the built up ice off the evaporator, the water from the melting ice then goes down the defrost drain to the defrost pan at the back of the refrigerator where it will sit and be evaporated by the heat from the compressor. Now that you know all the components of the defrost system in your GE refrigerator you can now begin to troubleshoot the problem. Step 1: Unplug the refrigerator! 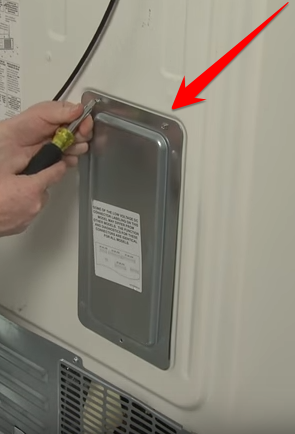 Then Remove the main control board cover plate from the back of the refrigerator. Step 2: Once you have the control board cover removed look at the bottom of the board and remove the blue plug connected to the three big pins, sometimes they are pretty tough to get off, but do not go prying on it. If it seems to difficult use a pair of needle nose pliers to pull the plug off with. Also unplug the white plug on the right side of the the blue plug. Step 3: The Freezer will need to still be cold for this test work properly. Using your ohm/volt meter put the red lead in the center plug of the blue connector then put your black lead on the farthest left pin of the white plug it will be the pin with the orange wire and that circuit should have continuity. If the circuit is open then either the defrost heater or the defrost bi-metal thermostat is bad. If the circuit does have continuity then those two components are good and you will need to check the evaporator thermistor as shown in step 4. Step 4: Unplug the J1 connector from the board, this is the white plug at the top farthest to the right, if you are unsure just look at the board pin layout image referred to earlier in this article. Set your ohm/volt meter to 20k ohms. Insert your black lead into the 5th wire on the white connector and your red lead into the 4th wire as shown in the image below and you should get in the range of 15k - 2ok ohms, if not the evaporator thermistor is bad. 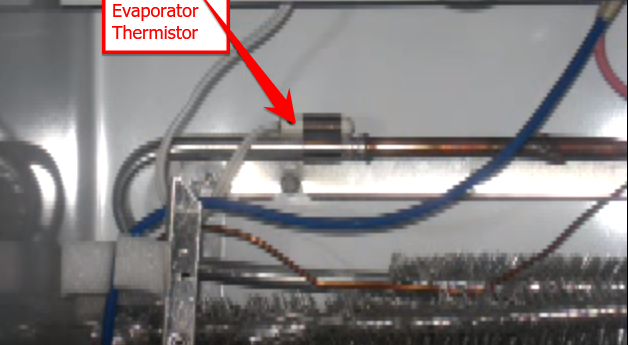 Step 5: If the circuit was open in step 3 then you need to take the defrost heater out of the freezer and check the defrost heater for continuity if it does not have continuity its bad and that is the problem. 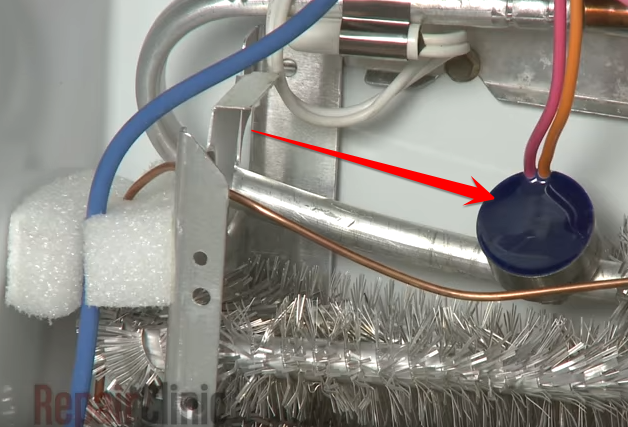 If the heater checks out to be good, then you need to check the defrost-bi metal for continuity, keep in mind the defrost bi-metal will need to be cold before checking it, so if its not cold drop it in a glass of ice water for a few minutes and then test it. If the defrost heater and the defrost bi-metal thermostat checks out good then the defrost circuit in the main board is bad. All the replacement parts can be ordered from the links below just click on the part names below to get ordering information about that part.